"The force is strong with this one". I am surprised with this tea. The strength of this tea caught me off guard. This 2007 raw tea cake is produced by Nan Qiao tea factory. I do not have much information on this tea factory except that it is located in the Menghai region in Yunnan, China. It was common that many owners of smaller tea factories usually learnt their tea production skills from working in the larger tea factories before they venture out forming their own tea factories. This tea cake had been stored in hot and humid Malaysia for about 10 years. The storage of this tea is clean and dry and I could hear the 'crispiness' while I broke up a tea cake to store in my tea caddy. This tea has bitterness with strong aromatic notes of hay and dry herbs. I only get a very faint sweetness after the tea session. I felt sweaty drinking this tea which lasted about 5 min. I must remember not to brew this tea on a hot afternoon. But I digress. A reader emailed me wanting to drink raw pu erh and asked for recommendations. I am sure many expert readers would and can easily mention the various blends and vintages they enjoy. My concern is whether a 'newbie' can enjoy and appreciate these tea we like. I would recommend trying as many raw tea as possible. One solution might be to contact tea writers on forums and blogs...when they write something about a tea that interest you, perhaps you can write to them to sell you a sample/samples of the tea that had been reviewed. It will allow you to compare notes. More importantly, you get to make new friends and would allow you to ask questions about tea. Tea writers can be very generous. Yes, you may find the tea different in what was described, but this is the fun of drinking tea; that a cup of tea will appeal differently to tea drinkers. As for myself, I started with a few cakes and used them for comparisons before buying more. A few friends now calls me a tea hoarder. That is another story. 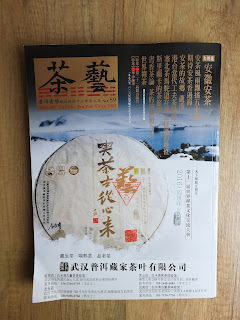 Tea Art magazine issue #59 main article was about Liu Ann Tea. I hoped the pictures on that article will give you an idea on the production of Liu Ann tea. This tea is mainly produced in Fujian Anhui in China. Vintage Liu An tea are now very expensive and are highly sought after by the Chinese tea drinking community. Liu An are traditional packed into bamboo baskets and this tea can be kept for many years allowing the tea to 'age' to a mellow and smooth tea. I was also told, while have tea sessions with my tea drinking groups, that Liu An tea was also drank as a medicinal drink. A good strong brew of Liu An tea will help alleviate cold and flu symptoms. Old Chinese medical halls would often used Liu An tea as a liquid base to concoct a bowl of Chinese herbs for their customers. This issue also showcased young teapot potters. Notice the interpretation of the tea set in in the 7th pix. Nice. There was a rare article on teapots in English as well. Written by Chi Lin Lu, the author suggested that for collecting vintage teapots, a collector must be familiar with the clay, production styles and appearance of that period before you purchased a vintage teapot. The author compared teapot appreciation to that of buying vintage pu erh tea where a buyer must be familiar with certain characteristics of that tea citing features like type of paper wrapper used, size and thickness of the cake and even the appearance and depth of the cake centre hollow. An interesting read. Huang Chin Kuei, or more commonly known as Huang Jin Gui, is a oolong produced in the Fujian province in China. Fujian oolong is highly regarded by the Chinese tea drinking community as oolong produced there are considered 'traditional or original' as the tea there had been produced by many generations of tea farmers. Tea farmers in the many Fujian provinces would usually have a special name for their oolong tea. The four most famous names would be Rougui, Tie Kuan Yin, Shui Hsien and Bai Chi Guan. This Huang Chin Kuei is produced and packed into tins by Fujian Tea Import and Export Co Ltd under the Butterfly brand. Every tin is filled with 125g and you will noticed from the 2nd pix, that the tea is 'rolled up'. The tea leaves will unfurl when you brew the tea and the unfurled tea leaves looks greenish in my teapot as the roast levels of this tea was medium. This tea makes 5-6 good infusions. This tea has very good floral notes with a delicate sweet finish. I found this tea very suitable, when I had the tea served and paired, with a Chinese dinner.